Fine Art or Decoration ? Our prints are only sold in a limited serial of 30 pieces whatever the size and the support. Each print is signed by the artist and numbered from 1 to 30, it comes along with an authenticity certificate. The paper is definetely the favorite for collectors. Long lasting and easy to store. Photographs are printed with K3 epson pigments inks and available with 2 finitions : matte or shimmering, printed on Hahnemülle paper, without acid, museum quality. The matte finish paper is Hahnemühle Photo Rag with a weight of 308g/m². With its soft, fine surface structure this paper is very versatile and is just as well suited to colour prints. The shimmering finish, is Hahnemühle FineArt Pearl. The special coating of the FineArt Pearl paper (285 g/m²) ensures a classy pearl shine effect. The intense white is equally favourable for impressive contrasts and picture depths for colour photography. Very water resistant. Alud-dibond presents the photos in a timeless, frameless, minimalistic gallery look. Aluminium Dibond, consisting of an original photo print on traditionnal paper and mounted on a highly-stable aluminium Dibond panel. The image has a matte finish and is protected by UV laminated film. 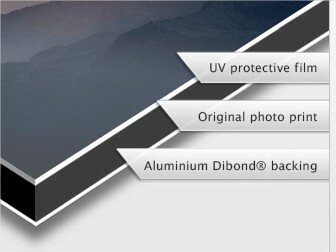 Original photo on aluminium Dibond ensures long lasting colors. This highly-stable and robust aluminium product can even be hung in rooms with lots of moisture or in outdoor areas which are shielded from rain. 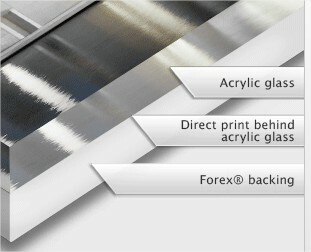 We affix an aluminium rail to the back of medium and large formats. 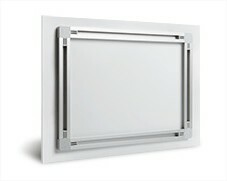 It is not visible from the front, meaning your picture will have the appearance of floating 1 cm from the wall. We mount this hanging system to your work prior to shipping. Acrylic glass support is perfect for exhibition. It looks modern, trendy and attractive. Acrylic glass present pictures in gallery quality, elegantly pure and crystal clear shape. Our premium, glossy acrylic glass gives colourful images lively brilliance and radiant depth. The acrylic glass gives your image remarkable depth and brilliance that will make an impact on any audience. The glass thicknesses, for Rare Shots collection is 6 mm (instead of 2 mm usually), to stengthen the effect. The original photo print is mounted on an aluminium Dibond base. This has proven to be extremely stable and is of the highest quality. Finally, the mounted photo is sealed under acrylic glass using elastic silicone. We use only Fuji DPII, a traditonal glossy argentic paper. it is sharp, brilliant, and its colours are luminous. Professional photographers rely on its combination of ultra-modern laser technology, traditional photochemical development, and the renowned, high-end photo paper from Fujicolor. Paper prints are send by mail in cardboard pipes. Each parcel is handled manualy and protected with great care. For a creative and unique look, print your photo or graphic on aluminum. 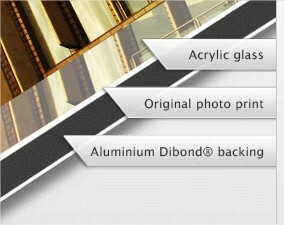 We print our photographs directly onto aluminum Di-Bond material, 3 mm in thickness. The printer inks penetrate into the aluminum surface, ensuring that the image is permanent and can’t be rubbed off. The image appears to change as you move past the art, and light is reflected off the surface giving it a luminescence. If you want to give your space a modern and high tech look, consider artwork printed on aluminum. A direct print on aluminium Dibond is a refined way to present your art, placing the viewer's focus entirely on your picture. This highly-stable and robust aluminium product can even be hung in rooms with lots of moisture or in outdoor areas which are shielded from rain. Using the latest in UV printing technology, the image is printed on an aluminium Dibond panel that has been primed with a platinum-white enamel. With a matte finish, the colours shine in detailed high resolution. 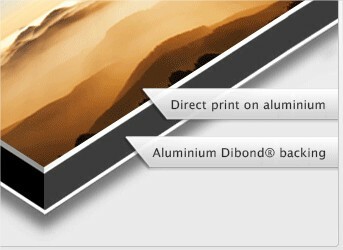 The direct print on aluminium Dibond is the most popular starter product. Alu prints are send by mail in cardboard flats parcels. Each parcel is handled manualy and protected with great care. Acrylic print and acrylic mounted photo prints can bring a whole new level of elegance to your wall decor. The appearance of images when mounted to acrylic plexiglass is stunning and dramatizes the look of lobbies, showrooms, restaurants, stores, conference rooms, and business spaces. In addition, acrylic mounted prints are striking when used in the home, and will be the talk of your friends and family. Plexi prints are rated for an archival lifetime of over 75 years. For an extra level of sophistication, we polish the edges of the plexiglass to a high gloss finish. Optional, but highly recommended due to the heavy weight of Plexiglass, the back of the photo prints might be finished with 1/8” Di-Bond aluminum board. Plexiglass prints are send by mail in cardboard flats parcels. Each parcel is handled manualy and protected with great care. If you are not sure, feel free to ask our advice. Our paper prints are sold without frame. If you want to make a present or don't like to frame it by yourself, you can have a look at our Whitewall laboratory great choice of framed products and choose from their website. We'll add it to your order and will send a qotation for approval to you. These past 20 years, photography has benefitted of a real interest from Art collectors. The acquisition of a photograph may be an impulse buy, but is more and more a good investment. Today buying a Fine art print should follow a few rules : buy only photographs from professional photographers registered at Agessa (an Artist status). Allways look for an original print, in a limited edition. 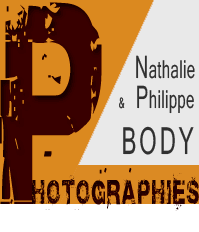 In France, the rule for a photograph is 30 prints whatever the size, the support or the medium sale of the photograph. If more than 30, it is no more considered to be a piece of Art and does not bneefits of fiscal privileged rules.